Subtitled "The Science and Technology of our Everyday Lives", this book is a walk through a typical day in Adam Hart-Davis's life, examining a number of the inventions we use all the time, usually without thinking about them. It's a tie-in for the TV series of the same name, which was shown on the History Channel in 2007. Have a look at this. 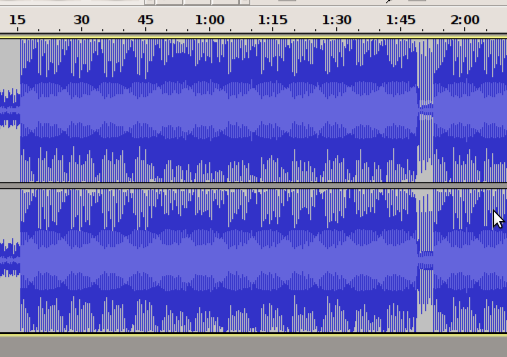 It's an audio track file, imported into Audacity. Pretty, isn't it? I know it's just a coincidence of scale and stuff (if you expand the scale, the pattern disappears) but it still seems appropriate that the track imported is one of the most beautifully geometrical, not to mention influential, dance tracks of the last 15 years, one which still sounds fantastic today. Yes, I talk of none other than Stardust's peerless "Music Sounds Better With You". prink·ly (prĭng'lē); adj., -li·er, -li·est. Prickling or tingling or tickling: "My socks are prinkly"
Probably a portmanteau of "prickling" and "tingling"; originated at about 1500 (yesterday) when K was trying to describe how her socks felt. Now generalised to include any clothes she doesn't want to wear. I've been away on business for a couple of days and the time on the train and in a hotel room has given me the chance to do some solid reading. Although you may choose to disagree with my definition of "solid" once you see what I've been reading. I've been overweight pretty much all of my adult life. Not gut-bustingly fat, but, um, "solid". "Chubby", as one of my friends said the other day. I honestly believed I was "big framed" or some such nonsense, and was envious of my sister for having inherited the "right" genes from the other side of the family that kept her looking so slim. (Of course I didn't realise how much effort she put into that; I do now).